1. Christopher Nolan has always been a filmmaker of contradictory impulses. He wants to awe you with spectacle but also capture the restlessness of the soul, to twist every emotion for all its worth but also stand outside and objectively observe, to be plain and direct and earnest but also leave you locked in puzzle-boxes to take apart and put back together again. He is ambitious but reserved; pop but art; loud but quiet. He has been wrestling with all these impulses for years, sometimes resulting in the greatest popcorn blockbuster of this century (The Dark Knight) and sometimes resulting in an awkward, overly complicated mishmash of corn and kitsch (Interstellar). He has a filmmaking instrument of almost overwhelming power, but has, especially recently, had an increasingly difficult time reigning in that power. Which is why Dunkirk is such a staggering, almost fantastical achievement. It takes everything Nolan does well and everything he doesn’t, everything he fights against and everything he embraces, everything great and terrible about him, and streamlines it, focuses it, until it’s pure Nolan, straight into your veins. It’s the most Christopher Nolan film imaginable. It also might just be his best one. 2. At first, you almost might mistake Dunkirk for a conventional, even straightforward war film. We are thrust into the moment at the beginning of World War II when more than 300,000 troops of Allied (but mostly British and French) forces are surrounded by the German army on the beaches of Dunkirk during the Battle of France, with little hope of escape, victory or even survival. The troops are sitting ducks, but Nolan, almost immediately, begins expanding the canvas. On land, we meet Tommy (Fionn Whitehead), a private who is neither brave nor cowardly, just a kid who’s way too young to die trying to figure out a way not to. By sea, our guide is Mr. Dawson (Mark Rylance) and his son, civilians who, along with a teenage stowaway, leave their ports in England to come help stranded soldiers before they’re picked off by the Germans. And by air, we meet a taciturn, nearly silent pilot (Tom Hardy) who communicates everything we need to know about him, and his mission, through his eyes. 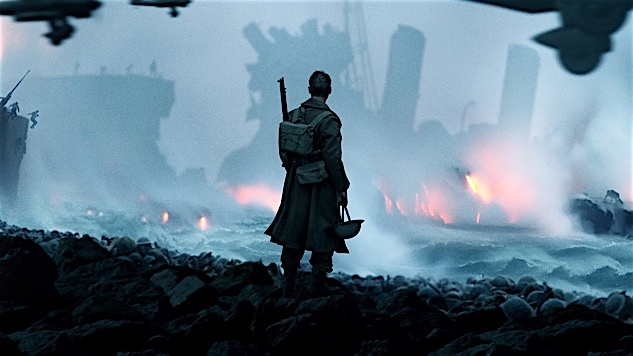 The movie cuts back and forth between the three stories—labeled on-screen as “The Mole,” “The Sea” and “The Air”—but it quickly becomes clear that Nolan has more up his sleeve than just some creative crosscutting. 3. It begins to dawn that Nolan isn’t just cutting in different storylines: He’s intersplicing different timelines all together. The “mole” plotline covers the full week of the siege; the “sea” is over several days; and the “air” a mere matter of hours. A big part of the fun—as much “fun” as Nolan is willing to grant in a movie this relentless—is puzzling together the timelines and plotlines, maneuvering the narrative into a linear sense. But Nolan isn’t just handing you a Rubik’s Cube just for you to diddle around with. (It’s not particularly difficult to solve anyway, and it’s not meant to be.) He’s purposely disorienting you the way these soldiers are, plunging you into a terrifying world in which everything is coming at you from every direction, leaving you floating adrift in space and time, with no earthly escape possible. I don’t remember a war movie that made me feel more directly involved in the battle, like the bullets and bombs and torpedoes were coming at me next. Nolan grounds the action in the real, grimy, lost faces of these soldiers, and their confusion and terror is your own. It as immersive as a war film platform imaginable. At multiple points, I found myself looking around the theater, even off-screen. What was that? Where’s that coming from? What is happening? 4. This doesn’t distract from a breathtaking visual grandeur that’s even more impressive by how little effort Nolan spends calling attention to it. Nolan has sometimes had a tendency to let his battle and fight scenes become cluttered, more focused on chaos and clatter than coherence. But Dunkirk has a clean, crisp landscape that makes the fear that much more palpable and real. In particular, the air sequences seem revolutionary, with a clear, understandable logic that helps you understand what everyone is doing, why they’re doing it and how terrifying it is to be in the middle of it. That he does this almost completely without dialogue—Hardy can’t say more than 10 words in the movie—is a magic trick of magnificent confidence. There isn’t a second of Dunkirk that doesn’t feel meticulously thought through and fussed over, but the movie isn’t a diorama: It lives and breathes and moves. You’re in it, and you can’t get out. 5. Nolan weaves three different stories with three different timelines played out among three different settings within the one larger landscape, and he does all this while still tying them all together both thematically and chronologically and hitting all the right emotional beats among the way. (For a filmmaker who isn’t always all that comfortable with heavy emoting, Dunkirk features some surprising, and often out-of-nowhere, shots straight to the solar plexus.) But it is noteworthy that this is Nolan’s shortest film, at 106 minutes, since his indie debut Following clocked in at 70 minutes (and $6,000 budget). Since breaking through, Nolan has occasionally gotten a little bloated, a little windy, a little too eager to say everything he has on his mind. But Dunkirk is tight, toned, vibrating with energy but never drawing outside the lines. It takes all Nolan has been trying to do with his movies and synthesizes it into one taut, pulsating package. It is Nolan at his absolute peak, doing everything he does best and discarding everything else. Dunkirk will bowl you over. It is almost too much power for one filmmaker to have. Grierson & Leitch write about the movies regularly and host a podcast on film. Follow them on Twitter or visit their site.